The simplest design can have the most universal appeal. This loose-cut, elemental top is simply good-looking on nearly anyone. Rib-knit boucle adds visual delight with intriguing texture. A-line shape curves slightly at the hem. Drapes remarkably, fitting a spectrum of sizes. Low-cut armholes; meant to be worn layered over a fitted top. Approx. 29" long. Imported. Acrylic; hand wash. One size fits up to 24. In Heathered Plum or Salt & Pepper. You'll want to spend all winter in these delightful leggings. Fleece-lined for sensational softness and warmth. Wide ribbed waistband and ribbed cuffs, intriguing chevron stripe texture. Imported. Polyester/spandex; hand wash. Sizes S/M, L/XL. 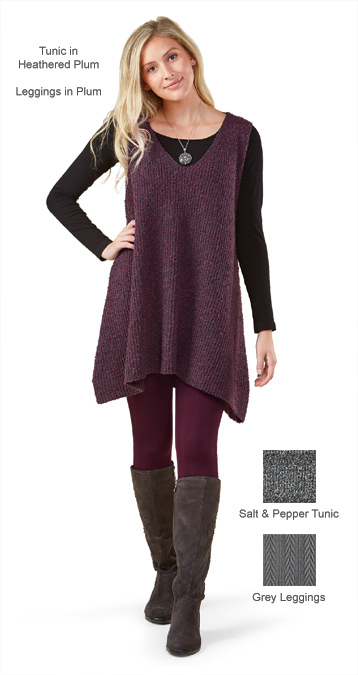 In Plum or Grey. This is beautiful! Very nice and soft...looks great and size is right on. Will be buying the salt and pepper colour, I love it that much! The product I ordered was way too big and also appeared flimsy. I returned it. These are the most comfortable I have ever had so I bought 3. the colors are great. Love this vest and you will too I am a larger size lady and this looks awesome on!